One doesn’t think of Columbus as having much in the way of topography and generally that’s true. It’s pretty flat and level around here. There are, however, exceptions and some of those are to be found a couple blocks east of High Street in the area to the north of campus. There steep-sided ravines and hollows mark where streams and creeks once flowed down into the valley of the Olentangy River. Iuka Ravine near E. 18th is one of these. 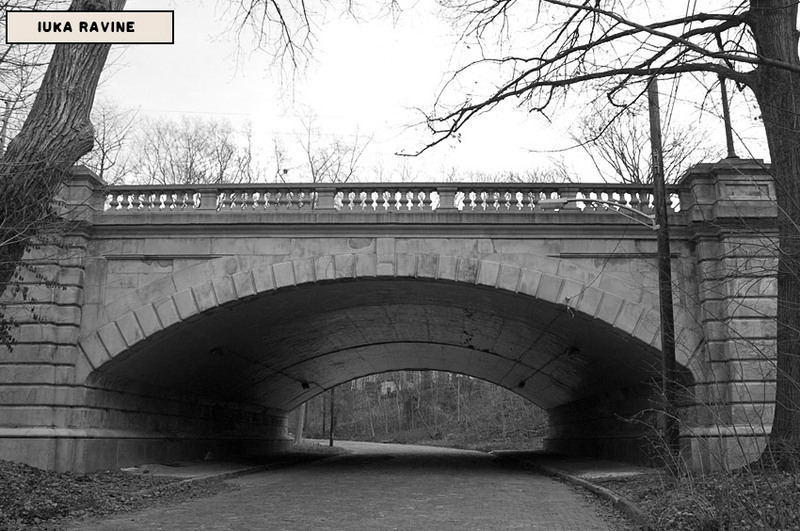 Indianola Ave. passes over the ravine on a graceful, arched turn-of-the-century concrete and stone bridge with lots of simple but attractive decorative features. It’s the sort of bridge they don’t build any more. At night, it gets really dark down in the Iuka Ravine. The bridge blocks most of the light from the street above and trees on the wooded banks hide the lights from nearby houses and apartments. Even though you’re in the middle of one of the most densely populated neighborhoods in the city, the ravine can feel lonely and isolated, cut-off from the busy world around it. Maybe it’s just an consequence of the abundant shade in the ravine but visitors often say it feels a few degrees cooler there than just a block away. Some also say the ravine is haunted. For many years now, late night visitors to the ravine have reported seeing a hanged man or woman swinging from the bridge. Over the years, police have been called several times to investigate reports of a suicide that turn out to be nothing. The body always disappears when the witnesses look away. Witnesses differ on whether the hanged person is a man or woman although most accounts say it’s a woman. All agree that--man or woman--the person’s clothes seem antique. Local legend provides a pair of back stories for the hanging ghost. One version identifies the ghost as a distraught early 1900s coed who took her life. It seems that the naive young lady fell for a dashing fellow student who took advantage of her affection to satisfy his carnal lusts. He pledged his undying love for her and showered her with sweet words and small gifts. He wrote her little poems. He promised to marry her just as soon as he graduated and came into his trust fund. In the meantime, since they were going to be married anyway, what would be the harm if they partook of the pleasures of wedded life? In time, the trusting miss became pregnant as a consequence of their couplings. She announced this to her swain, who drove her from his rooms in a rage. He had never had any intention of marrying her, he shouted. He had never claimed he loved her. She had just been his plaything. He called her a a whore, a fallen woman. If she was of such low moral character as to give herself to him out of wedlock, who knew how many others there had been? The child could belong to any one of her dozens of lovers. She returned to her dormitory in tears and incoherent. Her roommates tried to comfort her, thinking he had only jilted her. They embraced her and brought her tea and sweet things and told her that her former lover didn't deserve her tears. He was a cad and had been seeing other girls the whole time he was seeing her. The coed foolishly confessed what had actually happened. Her friends turned to ice. They treated her like a leper. Her best friend acted as if she'd stabbed her in the heart. The gossip mill went into overdrive and by morning the entire dorm was shunning her. The dorm matron took her aside and told her she would have to move out immediately and that she'd be expelled from school. 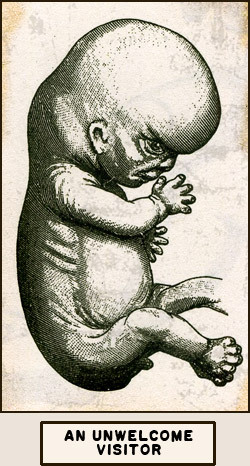 The despairing miss called on her beau’s father, hoping he would do right by mother and unborn child even if his son wouldn’t. He had her thrown out of his offices and threatened to have her arrested if she ever came around again. As a last resort, weighed down with unbearable shame, she turned to her own father, a grim, stern preacher of the old school. He gave her none of the sympathy or aid she sought but instead, damned her lust-mad soul to Hell and disowned her as his daughter. Disgraced, disowned, pregnant, penniless, and friendless, the girl tied a rope around her neck and jumped from the Iuka Ravine bridge to her death. Supposedly, on certain nights, her body still swings there, an enduring reproach to all those who failed her and her unborn child and left them nowhere to turn but Death's cold embrace. A more colorful but less likely story claims the suicide is a man or woman who went mad and chopped his or her family to bits with an ax before hanging themself. This seems like a confusion with a pair of area stroies that have nothing to do with the Iuka Ravine. In the 1910s, an insurance salesman living on Norwich did kill his wife, daughter, and sister-in-law, with an ax before killing himself but he shot himself instead of hanging himself and was never anywhere near the ravine. In the mid-20th Century there were stories told among area teens and college students about a residence on Wahalla Ravine--the old Mooney house--where a man's children disappeared and he was blamed for the murder. He was acquitted but, on returning home, learned his wife had killed them and buried them in the basement. He went mad and murdered her, buried the children's bodies under a statue in the yard, then hung himself from the Calumet Bridge over the ravine. Afterwards, the statue wept blood and the murderous man could be seen swinging from the bridge.